written by songwriter Fred Rose first recorded by Roy Acuff also recorded by Foster And Allen and by Willie Nelson. The video is of Foster And Allen. I have given the guitar chords in a couple of different keys. Also recorded by Shiana Twain, Vince Gill, Hank Williams, UB 40, Charlie Pride and Elvis to name a few. These chords are suitable for playing on the mandolin and ukulele. Here's the guitar chords for the Foster And Allen version. I [B]knew we'd never meet a[E]gain[A][E]. I [C#]knew we'd never meet a[F#]gain[B][F#]. Guitar chords in the key of C Major. 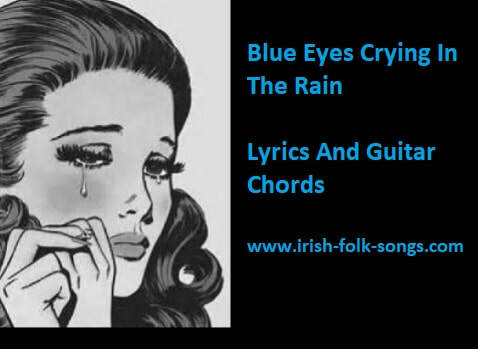 ​[C]In the twilight glow I see her [G]Blue Eyes Crying In The[C] Rain. As we kissed good-bye and parted, I [G]knew we'd never meet a[C]gain. [F]Love is like a dying ember Where[C] only memories re[G]main [C]Through the ages I'll remember [G]Blue Eyes Crying In The Rain.